Spring and summer bring a plethora of fresh fruits to your table. Why not let your dog enjoy a few of these as well? With obesity being high on the list of problems for our pets, fruit can be a nice healthy option. The same benefits fruits provide us – aids in digestion, antioxidants, immunity boosts, better eye sight, healthier skin and hair – they also provide for your dog. Beware though, not all fruits are good for your dogs so stick to the list because some, like raisins, can be fatal. First off, just as in humans, too much of a good thing can cause problems. 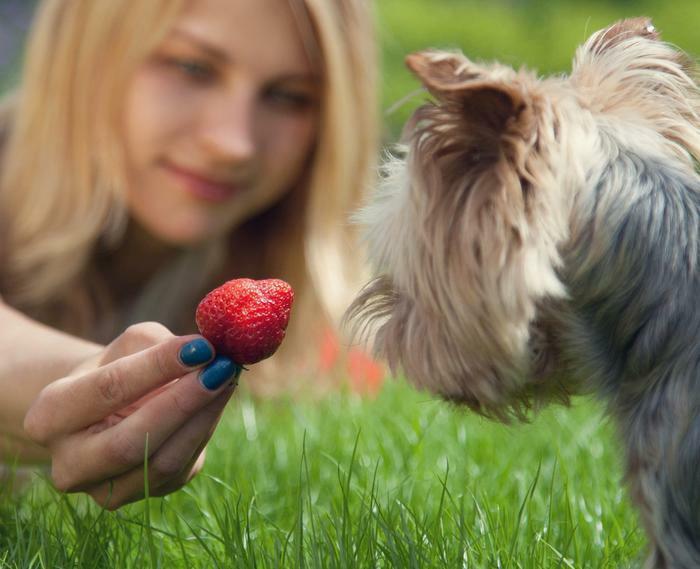 Start slow introducing fruit so your dog doesn't end up with the runs. Watch for allergic reactions as well. Remember that fruit is high in sugar. If you are thinking of using fruit solely for treats be careful you don't over-reward because you will still be packing on the pounds. Moderation is the key. Wash your fruit. Unless it came from your garden it probably has a nice layer of pesticides on it. A warning about seeds -- avoid feeding your dog any type of seeds or pits. Although not all seeds are known to cause problems, it is better to be safe than sorry. What is known to be problematic or toxic are apple seeds, apricot pits, nectarine pits, plum pits, cherry pits and peach pits. Apples Half an apple is a good size treat. Note: Do not give dogs the core or the seeds, which contain arsenic. Oranges Half of a section is a good size treat. Remove the rind and any seeds. Don’t give your dog any part of the tree -- it can be poisonous. Strawberries One strawberry is a good size treat. Bananas Cut about 1 inch as a treat. Throw the peel away. Blackberries 2 or 3 are a good size treat. Blueberries 4-5 is a good size treat. They are a super food for your dog Just as in humans there are many benefits. They are a great antioxidant. Studies have found dogs who eat blueberries have controlled blood sugar levels and may experience improved cardiovascular health. Cantaloupe 1 inch of a wedge is a good size treat. Kiwis Half a slice or one slice of kiwi is a good size treat. Pears 1 or 2 pear cubes is a good size treat. Pumpkin This is a wonderful treat for your dog’s health. It aids in digestion. Although you can feed your dog pumpkin seeds, most recommend feeding them to dogs unsalted, roasted and then ground. Do not feed your dog any other part of the pumpkin due to the small, sharp hairs on the pumpkin stem and leaves.1 to 3 tablespoons of pureed pumpkin [not pumpkin pie mix] is a good size treat. Raspberries 2-3 is a good size treat. Watermelon 1 to 3 pieces of 1-inch watermelon wedge is a good size treat. Do not feed the rind or the seeds. Can you and your dog share the norovirus?